She Dressed in Black: Our Little Shop of Typography Treats! Over the last week, we've spent a bit of time consolidating our range of typography prints that we offer on facebook. We must admit, it was getting a teeny bit crazy with the all of the personalised prints that we'd completely forgotten to update these in quite a while, oops! We are pleased to announce that our updated range has now been filtered through to our facebook pages and will be updated on Etsy very soon, too! 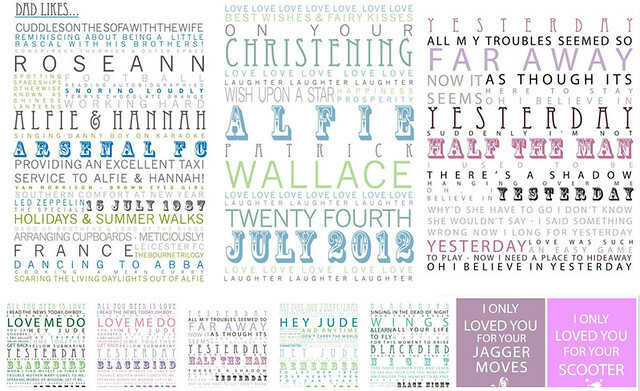 As well as the 'I Like You' personalised print, we now have customisable Wedding, Annivesary & Christening Prints as well as the newly added 'Dislike' print - for the more cynical friend or relative! We're so happy to say that our Ex-Boyfriend Series and Beatles prints have been really popular and they'll also be staying! In addition to that, we've also been super busy creating new prints and we'll be featuring one print each day, on facebook over the next week or so. Make sure you're following us to catch the first glimpse! To take a look at the range, please take a look at, PRINTS TO BUY. A5 prints are now offered at £10 (framed options available at £15) and A4 prints are now only £15 (framed options at £25). As always, we love working with you to create a print that is personal to you, so please get in touch to discuss colour options or email us at info[at]shedressedinblack.co.uk for personalisation enquires. Big thanks to everyone who has already purchased a print, we've really enjoyed working on all of them!